Send a smile to someone special with this adorable gift that’s sure to put a smile on their face. 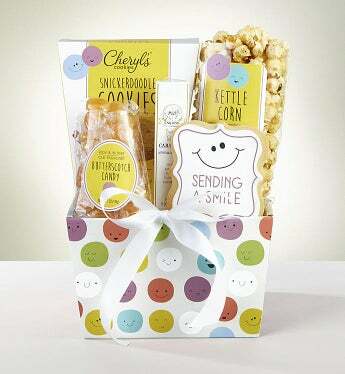 This colorful box is bursting with delicious gourmet sweets and treats including Cheryl’s Snickerdoodle Cookies, Creamy Butter Toffee Caramels, Rich Butterscotch candies, The Popcorn Factory® Kettle Popcorn, and a "Sending a Smile" Iced Cookie . You'll make their day!